Is Russia about to become another brick in the wall between Fiji and its Western friends? The official visit by Fiji’s Prime Minister, Commodore Voreqe Bainimarama, to Russia in late June has further developed a relationship that has been growing significantly closer over the last two years. In the course of the visit, he and Russian Prime Minister Dmitry Medvedev signed five agreements, covering topics from financial security cooperation and the abolition of visa requirements through MOUs on health and University cooperation to military-technical cooperation. For a brief hyperbolic moment, Fiji media reports  prior to the visit even suggested that Russia was about to open an embassy in Suva to substantially deepened the political relationship. Fiji’s pursuit of non-traditional friends has intensified while the grip of international sanctions has shown no sign of relaxation, despite the progress made by the Bainimarama Government toward elections by September 2014. Fiji targeted Russia as part of diplomatic initiative centred on the BRICS countries—Brazil, Russia, India, China and South Africa—from early 2011. In February 2012, Russian Foreign Minister Sergei Lavrov visited Fiji. This was followed up a few months later by a delegation of Russian officials including military officers. The nature of the mutual interest at that time was subject to the speculation that Russian interests lay in western Asia not the Pacific. This conjecture rested on Moscow’s pursuit of support for its position in the Caucasus region regarding the disputed territories of Abkhazia and South Ossetia. Australia’s then Parliamentary Secretary for Pacific Island Affairs, Richard Marles, openly accused  Russia of cheque-book diplomacy in seeking to buy international recognition for the two break-away enclaves . Russia does have some Pacific objectives of its own, as Russian President Vladimir Putin made clear in open the May 2012 Vladivostok APEC Summit. In its own pivot to the Pacific, RADM Sergei Avakyants, Commander of Russia’s Pacific Fleet, announced that, for the first time since the collapse of the Soviet Union, Russia would send new warships to the Far East in 2014 . Whatever Russia’s motives for encouraging the relationship, Fiji’s Foreign Minister Ratu Inoke Kubuabola, promoted the Moscow visit  as furthering Fiji’s BRICS initiative. This begs the question of what a BRICS strategy might be. Is it more than a slogan? The BRICS initiative is, of course, consistent with Bainimarama Government’s pursuit of greater South-South cooperation and support. Undoubtedly the prospect of the BRICS Development Bank is especially attractive in light of difficulties associated with other banks, where perceived Australian interference has worked against access to loans . The more immediate objective is political—to reinforce the Government’s increasing independence from its traditional friends as evidenced by its ‘Look North’ policy. At one level, the ‘Look North’ policy isn’t materially different from any other state beating a path to Beijing’s door in the Asia-Pacific Century. Yet, in Fiji’s case, it’s routinely contrasted with the less sympathetic treatment Suva receives from Canberra, Wellington and Washington, with the implication that China’s an alternative to these traditional friends. Fiji has joined the Non-Aligned Movement, sought greater South-South cooperation and elevated those regional arrangements that exclude Australia and New Zealand. The BRICS aspect of this agenda has been bolstered bilaterally with the opening of resident diplomatic missions in Brazil and South Africa In the past two years. Fiji has had diplomatic ties with China since 1975. The Bainimarama Government is open in its desire to establish new relations with states that understand and will support its domestic reform agenda. 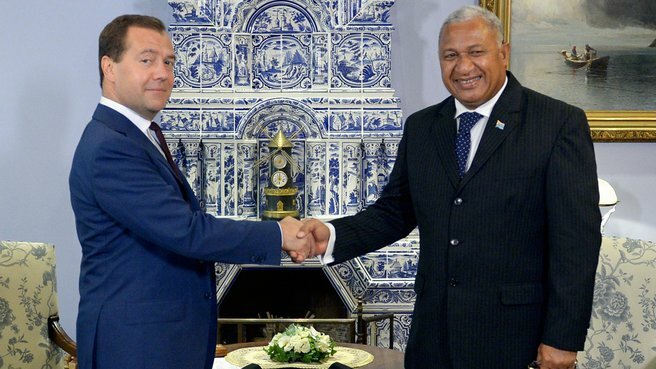 Russian Prime Minister Medvedev gave Fiji his backing , openly asserting that Fiji had the ‘right to be left alone’ by ‘other countries’, implying Australia and New Zealand . The potential military linkage is raising eyebrows externally especially in the wake of reports that Russia will help to equip nearly 600 Fiji troops  on UN peacekeeping deployment to the Golan Heights. Western sanctions have restricted Fiji’s access to military equipment resupply and modernisation since the December 2006 military coup brought Commodore Bainimarama to power. The Republic of Fiji Military Forces have made small arms purchases from Indonesia and talked with China about more significant assistance. The prospective loss of NATO interoperability with the RFMF has been a source of concern amongst some Western states during this time but not enough to address Fiji’s resupply and modernisation issues. Russian support for the Golan Heights deployment may just be the thin edge of the wedge—a trial prior to a more general re-equipment of the RFMF that will move it and Fiji further away from the country’s traditional Western alignment. Even if the Russian materiel for the Golan Heights proves more limited, it would still pose some significant challenges for Fiji’s diplomacy and even for the RFMF, which has enjoyed a well-deserved reputation for professionalism in its UN peacekeeping roles. Nevertheless, it has also maintained the confidence of the Israelis when deployed along their borders. The Fiji mission is fraught enough due to the difficulties that have seen peacekeepers from other countries withdrawn from the Golan Heights, as well as the Hezbollah activity through this area. Russia’s military support for Syria including the recent supply of anti-aircraft missiles to prevent Israeli attacks on Syrian weapons facilities made Tel Aviv suspicious  of Moscow’s influence on Fiji peacekeepers. That might be behind the clarification by Colonel Mosese Tikoitoga, the RFMF Land Force Commander, that the Golan Heights deployment already had the equipment they needed . Just how far Fiji will push the military relationship with Russia and what Israel’s reaction will be are yet untested. Nevertheless, the Bainimarama Government will continue to pursue its BRICS strategy, creating further impediments to a return to a normal relationship with its traditional friends until the impasse over sanctions is resolved. Even then, Fiji seems committed to new directions that will be more resolutely independent and Asia-focussed than pre-2006 and certainly with less of the ‘traditional’ in its relationships. Richard Herr is the Adjunct Professor of Pacific Governance and Diplomacy at the University of Fiji where he is also the Honorary Director of the Centre for International and Regional Affairs. Image courtesy of the Government of the Russian Federation .